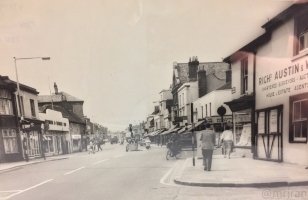 The main road out of town to the east, like its bigger brother West Street, East Street was designated A27 in 1922 and lost this status in 1971 to Eastern Way. Despite being home to a number of shops near the central point, the street has itself avoided much of the bustle of the town centre. 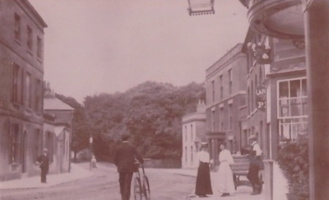 The Red Lion Hotel deserves a special mention here because it was historically a coaching inn, built to serve horses and their owners travelling along what became known as the A27. Its location was a key trading point, the wide junction with the High Street being the main market place before various changes saw this shifting further down West Street. There were coachworks alongside it too, now an estate agents. To the side of the Red Lion Hotel was a printing works, now Madison Court. Until Bath Lane, the street remained reasonably commercial, the Corner House Bakery (Soothill's) being the greatest survivor. The Cedar Cottage tea room and Cedar Garage were built on woodland at the corner of the junction, becoming a Land Rover dealer and then Cedar Court. Fareham's Conservative Association was previously an employment centre, while to the north was Kingston House Hotel and Fairfield House/Fareham House (which became Wykeham House Scool in 1986, which went bankrupt and became housing). At the back of the school is a building labelled High Walls. The descent down the River Wallington was known as Bridgefoot Hill, which appears to have been an official name that's largely forgotten today (it still appears on some maps). Bridgefoot Drive existed to serve Beech Lawn, another building at the back, before gaining more properties in the 1960s such as Little Orchard, Blackheath, Ananda, Warramanga/Montana and Woodcote Lodge. The properties on Bridgefoot Hill itself are older, and also all named: Bridgefoot Cottage became Ivy Cottage, and a new Bridgefoot Cottage was built opposite. It is at Delme Roundabout where East Street has seen the greatest changes. At the bottom of the hill, the road would have swerved sharply to the right, in front being the mill pond. This was an accident blackspot of its time, and there was a history of people coming down the hill and ending up in the mill pond. 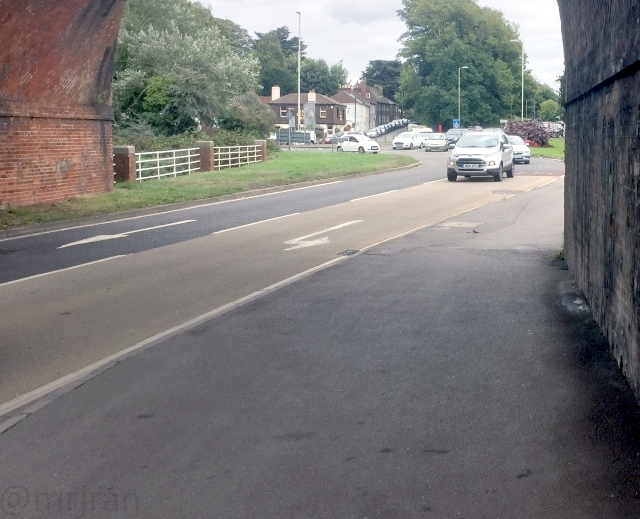 This alignment can still be seen in the way the pavements split, helping vehicles to navigate the sharp bend. Lysees Lane and The Esplanade joined here, now the exit from the car park. The bushes in this area which look like they have been there a long time were planted in the late 1980s. It was bare until then. From here the line of East Street can be seen in a short stretch of effectively abandoned road now used for parking. Of course, Delme Roundabout is far from round and part of it appears to be heading straight for this section of road. That'll be because it is a recycled part of it! It seems that the road then ran straight along the edge of the pond, perpendicular to the railway arch, and it then crossed the river at an angle to meet Shore Road, Cams Hill and the grand entrance to Cams Hall. Where the road crossed the river stood Fareham Mill (also known as Clarke's Mill and Cams Mill), dating back to the 11th Century. The mill was used to grind corn using water that entered the mill pond (roughly what is in the centre of the roundabout today), but by the 20th century it was silting up and wasn't very effective, but remained until 1919 as it was useful for controlling flooding. A stone on the roundabout commemorates this. Perhaps before the mill was closed, the original brick arch bridge was replaced by the more modern one which the Delme Roundabout uses today, or maybe parts of the mill were used until the river course was changed in the 1967 to control flooding. I say this because the one the roundabout uses is wider at one end than the other, and the secondary channel which runs under the bridge may well have been important to the mill. 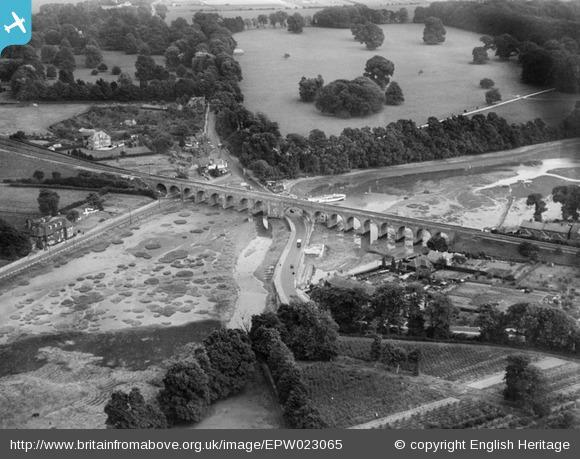 In November 1983 a plane collided with the railway viaduct, causing damage which had to be repaired. The pilot's intentions weren't clear, but he provided his destination as "Fareham" and was later spotted above Lee-on-the-Solent airfield, then Wallington. It then turned and struck the viaduct at a right angle, having speed up and using full throttle, then fell into the creek. The report adds that the plane would have never have fit through the arch, and recorded a verdict of "suicide", which not everyone supports. The much larger arch is built at an angle, but not the same angle as the roundabout which uses it today. Instead, it is further evidence of the intermediate alignment of East Street. So with East Street having ran on two slightly different alignments, the biggest changes came in 1971 with the opening of Eastern Way, and with that, the Delme Roundabout. This saw East Street truncated back to Lysees, with the rest of the route being consumed by the roundabout. The flyover, J11 spur and Wallington Way were all later additions, but it saw a lot of land being reclaimed. 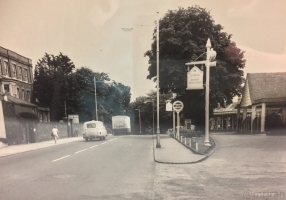 The original meeting point at Cams Hill (known as Delme Arms Corner) was partly consumed by the realigned Cams Hill, which was built on a higher level and effectively covered the old road. Its location can be found by the end of the isolated section of Wallington Shore Road.